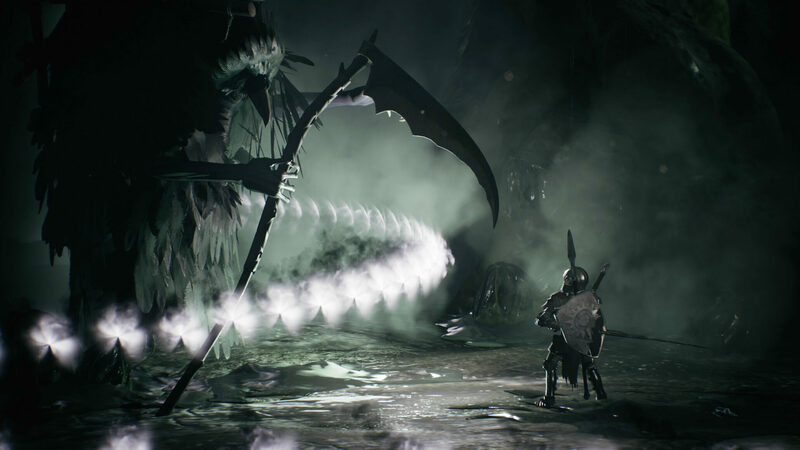 I know it’s uncool to compare something to Dark Souls these days, but what does one do when something so clearly fits into the emerging Souls-like genre? Hey, there’s nothing wrong with it. Dark Souls’ unique brand of reward through masochism is uplifting and invigorating, in its own weird way. The only question is if whether the new Souls-like games can capture that same feeling of mastery and reward with a delicate balance of difficulty and a gentle-ish skill curve. 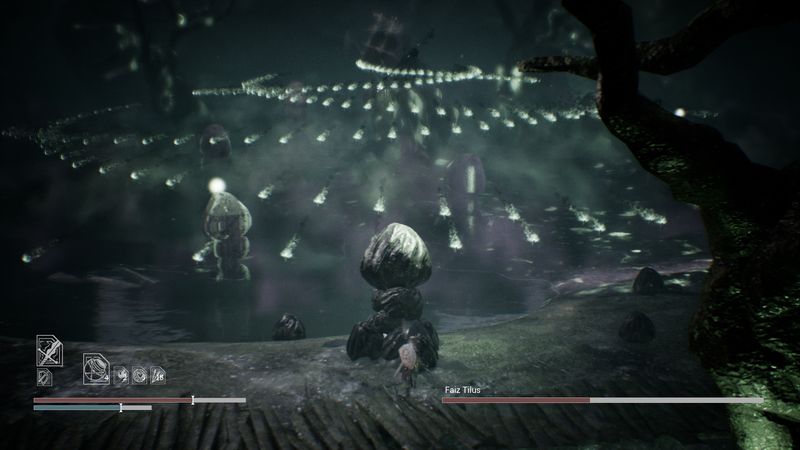 Sinner: Sacrifice for Redemption is a game that manages to capture that balance surprisingly well, but borrows a lot from the genre’s namesake to do so. The game begins with you waking up on a precipice surrounded by tombstone-like monuments. Here, you can make a sacrifice to the monuments in order to pass through and visit a new location, with new enemies. Each sacrifice acts as a permanent debuff, and behind each monument is a new boss. Yikes. Luckily you’ll get new weapons to offset this, but it means you’ll have to get good pretty fast. Though if you’ve played through a Dark Souls game, you likely already know what kinds of enemies await you. The first boss is actually two that switch between one another, and swap health bars, before both get involved in the fight at the same time during the final phase, triggered by getting either one to 50% HP. One deals with floating daggers and deadly swipes of a rapier, while the other specializes in lightning magic, bringing down bolts that spark on the floor and spread like an attack from a bullet hell game. Separately they’re tough, but to beat them together you need to have learnt their attack patterns from fighting them separately, and then put them together at the same time, causing you to be aware of much more than one set of attacks; especially when you have to deal with floating daggers, homing sickles, and multiple sparking lighting strikes darting about the floor. And that bullet hell comparison is pretty apt for other bosses, where you’ll often have to rely on the overworld design to protect you from many projectiles – many being the operative word, for at times it’s hard to see the individual bullets from the many others flooding your view. That brings it’s own problem though, as the camera likes to let obstacles in the environment get in the way. The camera passes through them, but they’ll block your view momentarily, and when there’s multiple it can become a regular annoyance. It’s strange since you can lock on to bosses, which makes your character face and strafe around them, but the camera is always fixed on to bosses, it’s just your viewpoint that changes. This means should you desire to make a hasty retreat from a deadly AoE attack, you won’t always be able to see where the edge of the stage is, or if there is anything in your way, whether you’re locked on or not. There are a few other little design quirks that hint at this game not being quite finished yet, too. Some scenes seem like they should contain dialogue audio, but they don’t, and the audio mix for the sound effects is a little bit uneven right now. 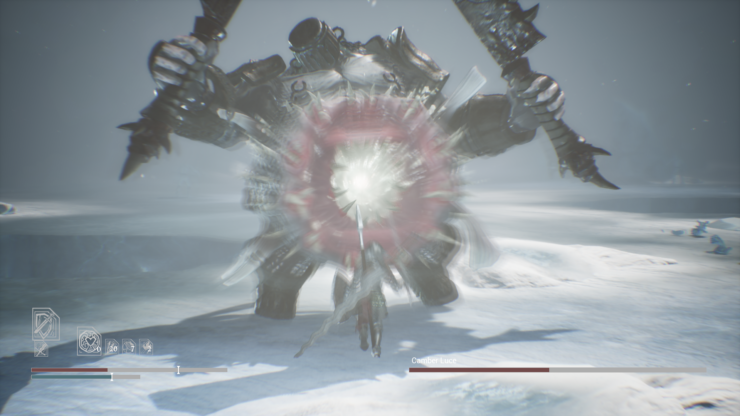 The sound effect of the large sword dragging across the ground as you move with it was jarring for me – the noise was far louder than other sound effects in the mix, and I thought it was a warning for a boss attack or something. A few other sound effects were odd too, but honestly, it’s a minor annoyance that will get worked out in time. The meat of Sinner is in its combat of course, which is why it’s more of a boss rush game than anything else, and its combat is definitely satisfying. Large critical hits with the greatsword sound meaty and chunky, and getting your I-frames out for a perfect dodge is as satisfying here as it is in Dark Souls, just as the parries are. And yes, the combat does reward mastery. On my first encounter with the first boss, I quickly had the “Can I do this?” moment, where I doubted myself. Yet I defeated the boss on only my fourth try, giving me plenty of confidence going forward. These bosses feel overwhelming, but importantly, they’re not. They are most definitely conquerable and there’s plenty of satisfaction to be had once you take them down. 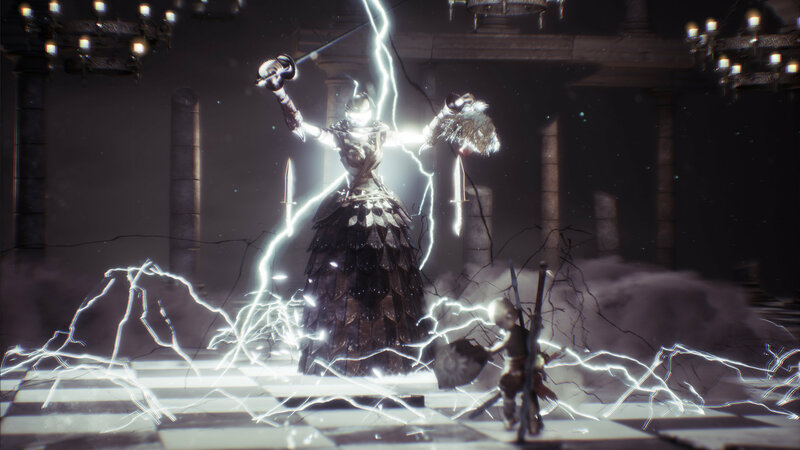 My early impressions of Sinner: Sacrifice for Redemption are incredibly positive, the combat feels good and the boss designs are interesting. Right now though it feels like Sinner: Sacrifice for Redemption needs a better world to ground itself in. I didn’t feel like I knew where I was, or why I was defeating these bosses, but I suppose that’s a mystery left to the final release. If you like action combat and a decent challenge, Sinner: Sacrifice for Redemption is definitely worth keeping an eye on. The game is due to release on April 25th, 2018 for PC, PlayStation 4 and Xbox One; PC gamers interested in checking out the system requirements can find them already on the Steam page.